Kevin Theis, Ph.D., is an assistant professor in the Department of Biochemistry, Microbiology and Immunology for the Wayne State University School of Medicine. Dr. Theis, a broadly trained behavioral and microbial ecologist, joined the School of Medicine in 2015. He received a bachelor’s degree in English from LeMoyne College in 1996 and a second bachelor’s degree with Honors in Environmental and Forest Biology from the SUNY College of Environmental Science and Forestry in 2001. He received his dual doctoral degree in Zoology and Ecology, Evolutionary Biology, and Behavior from Michigan State University in 2008, working in the laboratory of Dr. Kay Holekamp. He did his postdoctoral research in animal-microbial ecology in the laboratory of Dr. Thomas Schmidt, also at Michigan State University. 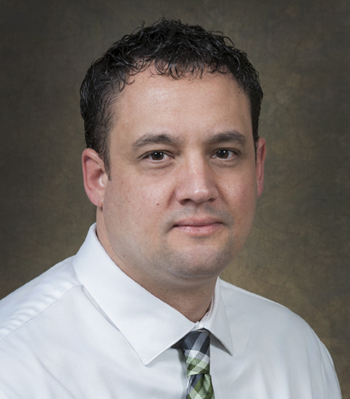 Before joining the faculty at Wayne State University, Dr. Theis was a research assistant professor in the Department of Internal Medicine at the University of Michigan. His research focuses on host-microbe interactions. Specifically, he is determining whether we can effectively manage the human microbiome in the context of maternal-fetal health and disease, and elucidating the reciprocal influences of the microbiome on animal behavior and animal behavior on the microbiome. Dr. Theis' lab takes a hologenomic approach to investigating pathogenic and beneficial host-microbe interactions within the realms of medicine and behavior. All animals are populated by diverse communities of symbiotic microbes. In fact, the vast majority of cells and unique genes associated with animals’ bodies are of microbial origin and animals have potential access to the products of their microbes’ genes. Certainly some symbiotic microbes are pathogenic, but many, if not most, are beneficial to their hosts. For example, symbiotic microbes are critical contributors to animal nutrition and immune health, and they can serve as important catalysts for the effective development and functioning of animal tissues. As a consequence of these realizations, many biologists are beginning to view animals and their symbiotic microbes as emergent individuals, that is, as holobionts rather than as autonomous entities. The Theis Lab takes a hologenomic approach to investigating pathogenic and beneficial host-microbe interactions within the realms of medicine and behavior. Preterm birth is the leading cause of neonate death, and its persistent effects remain a primary cause of death among young children in general. Worldwide, 15 million premature neonates are born annually, and urban environments in the United States, including Detroit, Cleveland, St. Louis, Baltimore, New Orleans, and Atlanta, have among the highest premature birth rates. Intra-amniotic infection is the only etiology of preterm birth for which definitive causation has been established. Nevertheless, many of these infections are subclinical and we lack efficacious predictive microbial biomarkers of preterm birth risk. A principal focus of the Theis Lab is studying the microbial ecology of human reproduction to identify and ultimately manage polymicrobial causes of preterm birth. Behavior is a primary means animals have for mediating their circumstances within the dynamic physical and social environments they inhabit. Therefore, behavior can be a primary target of natural and sexual selection. It is becoming increasingly clear that symbiotic microbes can substantially contribute to animals’ behavioral phenotypes. For example, they can protect their hosts from predators, increase their foraging efficiencies and reproductive outputs, and serve as the integrated machinery behind their chemical communication systems. The Theis Lab uses a comparative, multi-omics approach to elucidate and evaluate the functional and developmental ramifications of animals’ coevolutionary relationships with odor-producing symbiotic microbes. The Lab also investigates how animal social behavior, at individual and landscape levels, influences the structure and function of microbiomes. This research is providing natural animal model systems for addressing critical inquiries in human disease ecology. Theis KR, Romero R, Winters AD, Greenberg JM, Gomez-Lopez N, Alhousseini A, Bieda J, Maymon E, Pacora P, Fettweis JM, Buck GA, Jefferson KK, Strauss III JF, Erez O, Hassan SS. Does the human placenta delivered at term have a microbiota? Results of cultivation, quantitative real-time PCR, 16S rRNA gene sequencing, and metagenomics. American Journal of Obstetrics and Gynecology. Accepted. Theis KR. Hologenomics: systems-level host biology. mSystems, 2018; 3(2):e00164-17. doi: 10.1128/mSystems.00164-17. Xu Y, Romero R, Miller D, Silva P, Panaitescu B, Theis KR, Arif A, Hassan SS, Gomez-Lopez N. Innate lymphoid cells at the human maternal-fetal interface in spontaneous preterm labor. American Journal of Reproductive Immunology 2018; 79(6):e12820. doi: 10.1111/aji.12820. Whittaker DJ, Theis KR. Bacterial communities associated with junco preen glands: preliminary ramifications for chemical signaling. In Chemical Signals in Vertebrates XIII, Shulte B, Goodwin TE, and Ferkin MH (Editors), Springer, Chapter 8, pp. 105 – 117, 2016. Theis KR, Venkataraman A, Wagner AP, Holekamp KE, Schmidt TM. Age-related variation in the scent pouch bacterial communities of striped hyenas. In Chemical Signals in Vertebrates XIII, Shulte B, Goodwin TE, and Ferkin MH (Editors), Springer, Chapter 7, pp. 87 – 103, 2016.